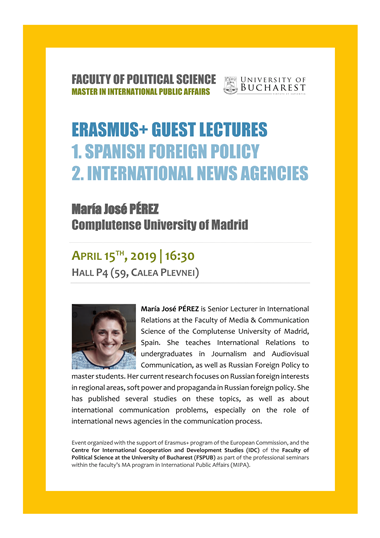 María José PÉREZ is Senior Lecturer in International Relations at the Faculty of Media & Communication Science of the Complutense University of Madrid, Spain. She teaches International Relations to undergraduates in Journalism and Audiovisual Communication, as well as Russian Foreign Policy to master students. Her current research focuses on Russian foreign interests in regional areas, soft power and propaganda in Russian foreign policy. She has published several studies on these topics, as well as about international communication problems, especially on the role of international news agencies in the communication process. Event organized with the support of Erasmus+ program of the European Commission, and the Centre for International Cooperation and Development Studies (IDC) of the Faculty of Political Science at the University of Bucharest (FSPUB) as part of the professional seminars within the faculty’s MA program in International Public Affairs (MIPA). The event takes place in English and it was designed for students of the MIPA program, with the first part being also open to undergraduate students of International Relations and European Studies. Other FSPUB students may also attend.